How Friday Fun works: take some time on Fridays to blog about something non-book related (or semi-book related): family, movies, politics, religion, food, or an adventure you've had. 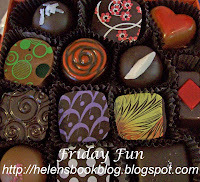 Please link back to this post and leave a comment with a link so I can read your Friday Fun post! This week we had some holiday fun! Last Sunday was Santa Barbara's annual Parade of Lights where the boats put on their holiday lights and sail from the harbor to the wharf and back again while people watch from the shore. At the end is a brief fire works display over the harbor. 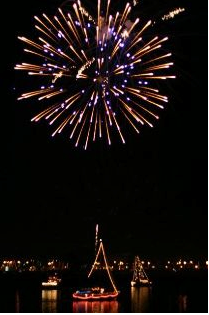 I love seeing the boats all decked out for the holidays and am always appreciative of a fireworks show! It doesn't get much better than being bundled up, snuggling with my daughter, sitting on the wharf looking out over the ocean and being in awe of fire works! I didn't take this photo, but thought it did a great job of showing the event. Wednesday night was the Holiday sing-a-long at my daughter's elementary school. Kids were encouraged to go in their jammies so I joined in and wore mine (hey, my mom went with us and I am her kid). I was very cozy, but I think my daughter was a little embarrassed! She teased me that she would tell people I was her "Aunt Claire from Canada" and not her mom :-) It was definitely the non-traditional holiday event since we sang songs like Frosty and Rudolf, leaving out anything with religious overtones. It was really fun to be cozy, happy, fed (milk and cookies provided), and to sing! I hope you and yours are enjoying the build-up to the holidays, whether you celebrate Eid, Hannukah, the Winter Solstice, Kwanzaa, or Christmas!